The 1908 House surrounds you with historic charm and all the comforts of home. 3000 sq. ft. of restored “classic Craftsman style ” with high ceilings, built-ins, leaded windows, period fixtures and furniture and glassed in porches. All this history combined with all the modern conveniences: stainless steel appliances, fabulous beds, gas fireplace, hot tub, walk-in shower, game room, and wonderful outdoor spaces. Bedroom #3 has a queen size bed as well as a futon, and access to the sunporch. Formal Dining Room with a built in sideboard, table seats 6 with large chairs or 10 with smaller chairs, we provide china and glassware for 20, everyday dishes for 30 as well. The basement of the house is the “Game Room” with an air hockey table, 2 full size arcade games, foosball table, stereo, Wii, X-Box, PS3, TV with VHS/DVD and over 350 movies, huge array of board games, dart board and a bar with a 2nd refrigerator. The room has an IKEA queen size folding futon/bed that can sleep additional guests if needed. The basement is also home to our new “Kids Bunk Room” with 3 twin beds, toy box full of toys, lots of kids books, even a “bouncer” and “activity chair” for infants. We provide highchairs, baby gates, port-a-cribs, etc. The Outdoor Kitchen, with a huge BBQ, cast iron sink, marble bar counter, roll around ice chest, everything you need for an awesome bbq. A very large and very private backyard with 3 dining tables, lots of lounge furniture, a 10 person hot tub, and charming patio lights to set the mood. In the front we have a fully enclosed glass porch with dining table with French doors out to the deck – perfect for sunny morning coffee. A private elevated deck with dining table, lounge furniture and a gas barbecue. I have been a flight attendant for 25 years and have traveled extensively - I have stayed in every imaginable type of vacation rental. I feel that I have created a home that will exceed any travelers expectations. I love historic homes and places and Oregon City - 'The End of the Oregon Trail' being located just minutes from downtown Portland was perfect. A/C in both master bedrooms, cold air pump in house. Towels and 'flip flops' provided. Surrounded by history, pampered and elegant rental. We were able to unplug in absolute comfort. We truly enjoyed the spa, deep bathtubs and elegance. Yet it was comfortable to have family dinners and play in the game room. The best of both worlds. 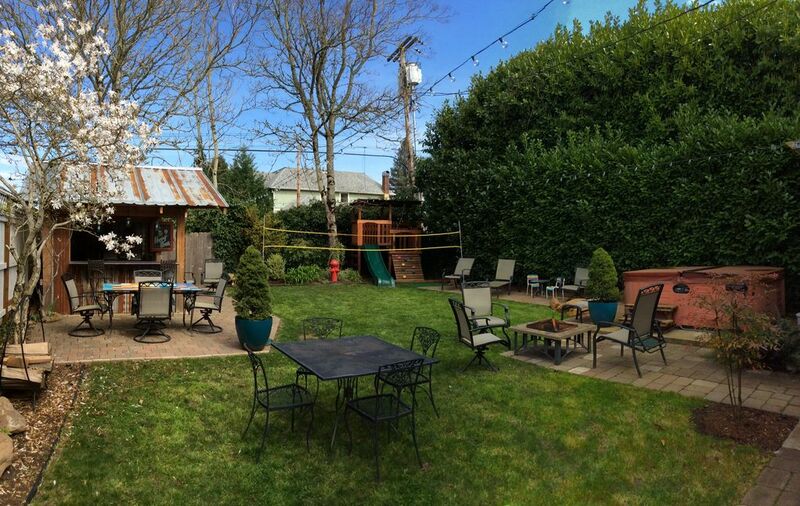 Wedding plans included a house close to the venue in Oregon City. Rooms are small and the house is squeaky, unique and homey. It is more like a 3 bedroom with small bunk room and a sun porch located through one of the bedrooms but absolutely functional if you don't mind someone accessing it through a bedroom . Lots of extra sleeping space with extra trundle beds and futons in several rooms. The basement while I read other reviews that it was musty... it is a basement for sure but was just fine and the kids had an amazing weekend with the games and so forth. The 1908 added a lovely touch to the memories of my sons wedding weekend. We put together wedding flower arrangements, played games, baked goodies and shared good times with friends and family. The hot tub was not functioning but that was ok, there was a family illness in the maintenance persons family and owner was responsive when we reported it and showed great interest in making sure our stay was a positive experience. for sharing your beautiful home with us, we all loved it. We enjoyed our stay for Thanksgiving weekend at this home! It is an older house but fully equipped with everything you need to have a good time! We were 14 adults and we all fit pretty well! It's a great place for a family. We came to Portland area for our son's wedding...the house was big enough for our family and very kid friendly...lots of games for the kids and a great fenced in back yard. I wish we would have had more time to spend there!! Thanks for sharing a great home! Loved exploring this lovely historic home!